When it came to the movie that finally made Rosalind Russell a bona fide star, The Women, she made a few smart decisions, even if one in particular was underhanded and not very professional. Although Norma Shearer and Joan Crawford were much bigger stars than she was, Rosalind was determined to have her name billed above the title and wasn’t willing to settle for “with Rosalind Russell” after the title. So this is what she did: after much of the movie had been shot, she pretended to be sick. “You couldn’t pull that trick in the first few days, they’d just replace you. I never attempted it again in my whole career, and I only did it that once because I had a feeling I could make it work…Norma Shearer wouldn’t give in on the billing, so I wouldn’t come to work. I wasn’t holding up production, they had plenty to shoot, but I let it be known that I was going to be under the weather for quite a long time. ‘That’s very nice of Norma,’ I said. Not only did The Women bring her the stardom and recognition she yearned for, it also brought her to the attention of the man who would become her husband of 35 years. On the voyage to America, he watched The Women on board, the only movie they would show, and Rosalind’s crazy antics caused him to proclaim: “I’m either gonna kill that girl, or I’m gonna marry her.” And marry her he did. Although Miss Russell had some trouble getting the bigwigs to believe she would be good as the vicious, gossipy Sylvia Fowler, she gave a rather exaggerated screen test that made them finally believe in her. The Women is a film full of women with no men in sight. The tagline says it’s “all about men,” but it’s more about the women in the film and the complicated relationships between friends and enemies. There are many different types of women represented in the film, from the good wife (Norma Shearer) to the gold-digging hussy (Joan Crawford) to the fiercely disloyal gossip monger (Rosalind Russell) to the naïve, timid newlywed (Joan Fontaine) to the older, more experienced mother of many (Phyllis Povah). I could go on and on, but these are quite a few of the different characters represented. When the movie opens and it starts with two female dogs yapping at each other and then we start to see the cacophony of yappity-yap from the mouths of the human females inside Sydney’s salon, it sets the scene for this film. We can all tell gossip will be a very important component of this film and how it damages others, as funny as the situations are. Incidentally, the first star the audience sees is the first creature shown—the dog who plays Toto in The Wizard of Oz, which was released the same year as The Women. 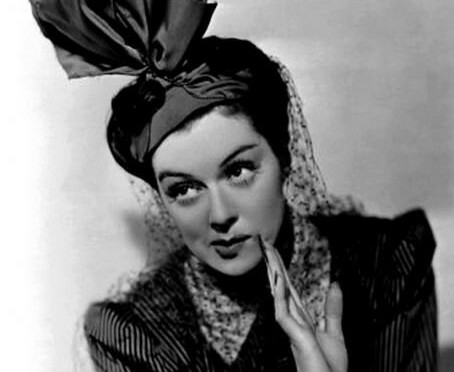 The first prominent character we see in the film is—ta-da—Rosalind Russell as Sylvia Fowler! She couldn’t look more bored as she sits in her chair, getting her nails done, while reading a magazine, her glasses dangling from her mouth so precariously. The manicurist, Olga (Dennie Moore), is rattling off one rumor after another, but Sylvia’s ears do not perk up until she hears the name of her friend and cousin, Mrs. Haines. It is not long before Sylvia is on the phone, spreading the rumor to another friend, Mrs. Edith Potter (Phyllis Povah), who has children (all girls) crawling all over the place. She informs her friend that “Stephen is stepping out on Mary” and “wouldn’t it be ghastly” if Mary was to hear about it? And “won’t it be too tragic, eating her food and knowing all about her husband?” This scene allows us to have a peek at what type of person Sylvia is. Let’s just say we wouldn’t want to have her as a friend. It also reflects the opening titles, which have each actress and character represented by an animal. For example, Mary (Norma Shearer) is a docile deer, Crystal (Joan Crawford) is a predatory cheetah, and Sylvia is a black cat, hissing. No, the black cat is not your friend and no, you do not want this black cat to be your friend. Another one—Nancy: (talking about Mary) “She’s content to be what she is.” Sylvia: “Which is what?” Nancy: “A woman.” Sylvia: “Oh, and what are we?” Nancy: “Females.” Sylvia: “And what are you, pet?” Nancy: “What nature abhors—I’m an old maid, a frozen asset.” A lot can be said about this absolutely brilliant screenplay, which was mostly written by Anita Loos and Jane Murfin based on the play by Clare Booth Luce, but a lot of writers contributed to it, including the famous author F. Scott Fitzgerald. That wonderful, biting dialogue is to die for! Before Mary comes in to greet her guests, Sylvia finally gets Edith in the bathroom, telling her more details about the rumor. Stephen has been seeing a woman named Crystal Allen who sells perfume at Black’s, Fifth Avenue. It is clear how Sylvia thinks she’s better than working class people; the way she looks down her nose at the fact that Stephen is seeing a woman so obviously beneath him is proof. In the middle of all this, Sylvia doesn’t pass up the chance to insult her friend: “You know I go to Sydney’s for my hair. Oh, you ought to go, pet. I despise whoever does yours!” Also, when she complains about the sort of creature Olga the manicurist is, it is ironic how it so accurately describes her: “You know how those creatures are—babble babble babble—a lot they care whose lives they ruin!” And that’s just what Sylvia’s set out to do. As Mary finally comes out to meet her friends, Sylvia starts right away in trying to get Mary to go to Sydney’s Salon, showing her the nail job they did on her. She smiles mischievously and devilishly puts her hands together after Mary makes it a point to remember Sydney’s and Olga’s names. In the next scene, Mary goes to Sydney’s just like Sylvia wanted her to and gets her nails done by Olga. Just like with any other customer, Olga quickly starts telling Mary the rumor about her husband. Mary is shocked and hurt by what is being said and Olga doesn’t realize the damage she is doing because she doesn’t know Mary is Mrs. Haines. Now Mary knows everything, including the woman’s name—Crystal. Before you know it, she is crying to her mother about her husband’s betrayal. I enjoy this scene because although her mother has very old-fashioned ideals, telling Mary she must ignore it and go on with her life and marriage as is, Mary is adamant and says she will not stand for it because giving in to it is “shockingly wrong.” Mary is acting more of a feminist than her mother is—at least for now. While Mary goes off to Bermuda with her mother to get away from her husband, her friends, and the rumors, Sylvia and Edith stroll over to Black’s to get a peek at Crystal for the first time. As Sylvia and Edith look around the shop, they know right away which one is Crystal as soon as they see her. Played by Joan Crawford, this man-eater has only one thing on her mind—getting herself out of this job as she uses her wiles on Stephen more and more. When Stephen calls her up at the shop, even though she has that tough kind of voice, as soon as she speaks on the phone, her tone has turned to such a sugary sweet one, working on getting sympathy from Stephen. This is a very funny bit because Virginia Grey (whose only scene is this one) is a co-worker of hers and the whole time she’s on the phone, she’s wisecracking about everything she says. As soon as Crystal hangs up, she declares: “Can you beat him? He almost stood me up for his wife!” But before she can leave to meet him, she has to go attend to some customers who asked for her by name—Sylvia and Edith, of course. As Crystal waits on them, Sylvia keeps looking her up and down and when Crystal mentions that “so many men” come into the shop that there would be no way that she’d remember someone named Stephen Haines, she responds, “I shouldn’t think you’d let that disturb you.” Crystal is getting fed up with Sylvia obviously (disguised as subtly) mentioning Mary’s name, trying to pry her for details. As Sylvia and Edith leave, Crystal “mistakenly” calls her Mrs. Prowler. Sylvia glares at her and corrects her: “Fowler!” She is convinced Crystal said it on purpose and declares she will have her fired and will go to management immediately. Suddenly, she and Edith fall into a cart headfirst that has come their way. Mary and some of her friends go to a fashion show at a posh clothing store and Sylvia is looking as wild and crazy as ever—large hat sticking straight up into the air, a very strange, ill-fitting dress, snapping her chewing gum loudly, and knitting while talking a mile a minute. It has been said that Norma Shearer was rather annoyed by Rosalind’s loud gum chewing, which was something she only did when she was working on a set and nowhere else. However, the director liked this part being added to Sylvia’s character so he let her keep chewing while the cameras rolled. This scene includes a color fashion show sequence which is about five minutes long. It is gorgeous to see the outfits and models in color—some outfits that were outrageous, some beautiful—although it adds nothing to the plot. It is after this fashion show that we see another complicated relationship of Sylvia’s—with the model named Princess Mara (Suzanne Kaaren)—causing Sylvia to snap at her, “I may not be a model, lamb, but nobody disputes how I wear clothes!” after Princess Mara insinuates that Sylvia’s husband flirts with her. As Princess Mara walks away, Sylvia shouts hilariously, “Did you get her innuendo? !” They all discover that Crystal has also come to the shop and Mary sees her for the first time. It makes her feel sick to see her and she immediately goes to a dressing room to try on a dress. It is obvious Stephen is “buying” Crystal because she is buying everything in sight, despite being just a perfume salesgirl. Suddenly, Sylvia calls outside Mary’s dressing room: “Yoo-hoo! May I come in?” Before Mary can respond, she bursts into her dressing room and tells her to go in and confront Crystal. She says she doesn’t want Mary to be made a fool of, but Mary’s faux friend only wants to start some trouble to satisfy her incredible thirst for gossip. She keeps getting into Mary’s face about the situation, buzzing around her like a bee, even at one point appearing behind Mary and showing up three times in the three-sided mirror so there are four Sylvias. The next day, Sylvia, whose mouth never gets a rest for a second, is doing some leg lifts with her exercise instructor. She does several of these lifts until she lies on her back and proclaims: “Ohhh, I am simply exhausted!” Sylvia, are your legs exhausted or just your mouth? Next, her instructor has her crawling up the wall slowly with her feet. Sylvia says to her, “The way you say that makes me feel like vermin.” The instructor replies, “That shouldn’t be too much effort… I mean, crawling up the wall.” Even after Peggy comes in late, they don’t actually get very much exercise done at all. What is mostly apparent are the wisecracks going back and forth between Sylvia and the instructor, such as Sylvia mentioning that most of her friends exit a room horizontally. Sylvia has other things on her mind when Edith bursts in, having some more juicy dirt. Sylvia would much rather exercise her mouth muscles than any muscles in her body. She informs her instructor she is done and when the instructor objects, Sylvia asks her, “Look, whose carcass is this, yours or mine?” The instructor responds, “Yours, but I’m paid to exercise it.” “You talk like a horse trainer,” Sylvia says. “Well, Mrs. Fowler, you’re getting warm,” says the instructor, ending the conversation. Edith tells Sylvia that she accidentally told Dolly Dupuyster (Hedda Hopper, in a role similar to the woman herself), a gossip columnist, that when Mary confronted Crystal in her dressing room, she socked her. Before you know it, Mary is getting a divorce from Stephen because the story is all out in the open about her confrontation with Crystal. She prepares to catch a train to Reno as her husband’s secretary comes over to get her to sign some papers. This is Ruth Hussey in a very small, insignificant role. She would be noticed a lot more the next year in her turn as Liz in The Philadelphia Story. Peggy, who has also had a falling out with her husband, Johnny, is also on the train with Mary to Reno. She cries the whole time, not really wanting to divorce him. Mary doesn’t want to divorce Stephen, either, but she tries not to let it show. It is on the train that we meet a few other colorful characters—the ever poetic, much-married Countess De Lave (Mary Boland) and Miriam Aarons (Paulette Goddard), a younger woman who has a sarcastic wit. It becomes the Countess De Lave’s trademark catchphrase to declare “Oh, l’amour, l’amour!” everywhere she goes. She is in love with love, but she always picks the wrong man, now getting divorced from her fourth husband. At the ranch for the divorcing women in Reno, the proprietor is Lucy, played by the always funny Marjorie Main. Miriam tells the Countess that she has been having an affair with Howard Fowler, who is Sylvia’s husband. Barely before she has let this little secret out, Sylvia has shown up at the ranch (“Who the heck is paging l’amour?”), ready to divorce Howard. This is probably the most famous and well-known scene of this delightful movie. Edith has sent Sylvia a letter with the latest gossip, as well as a clipping from a column naming Miriam Aarons as the woman Howard left Sylvia for. Miriam quickly backs away and gets on her horse to take a ride. Sylvia runs over to her, grabbing the reins. Forming her mouth into a big “O” and staring at her with those widened brown eyes, Sylvia starts to call her a name when Miriam fires back: “Don’t you call me names, you Park Avenue playgirl! I know a lot more words than you do!” Sylvia pulls Miriam off the horse and just as Miriam is about to hit her, Sylvia screams, “Don’t you dare strike me! I’ve got glasses on!” “Well, now you don’t!” Miriam takes the glasses off and hits her. Sylvia makes the most outrageous face and Rosalind breaks that rule that tells you that you cannot look straight into the camera. However, she does it anyway and it is priceless. Sylvia pulls Miriam’s hair and pulls down her skirt. Horrified, Peggy exclaims, “Oh, Sylvia!” It is funny how Miriam, who is a good four inches or so shorter than Sylvia, is a much better fighter than Sylvia. Sylvia is clumsy and even accidentally strikes the horse. Just when it looks like Sylvia is beat, she lifts her head and sees Miriam’s leg right in front of her. Licking her lips like she’s about to eat something delicious, she sinks her teeth into her leg. Miriam calls Mary a coward for “deserting” Stephen when it’s obvious he doesn’t love Crystal the way he loves Mary. Suddenly, Mary is very happy to finally receive a phone call from Stephen. Unfortunately, it is only to inform her that he has just married Crystal. She breaks down into fits of tears, not believing this is really happening. It is also on this trip that the Countess has already found a new man, a man with a southern drawl named Buck Winston. In general, he sounds like a loser, but the Countess is smitten. Some time passes and by this time, the Countess has married once again—to Buck. Crystal has become bored with her life as Stephen’s wife and has initiated an affair with Buck Winston. Sylvia also shows herself to be as disloyal as can be. She is not friends with Mary anymore and is now on Crystal’s side. She bursts in on Crystal while she is taking a bath. She shouts her usual “Yoo-hoo! May I come in?” but come in she does. Sylvia soon learns about Crystal’s affair with Buck Winston, whom she calls “the chambermaid’s delight.” She picks up the phone before Crystal does and it’s Buck. She snorts and cackles in loud laughter, telling her he didn’t say anything: “Not a thing, not a single thing, he was singing!” and she goes on to mimic his strange yodeling. In the large powder room, some women have gathered there to touch up their makeup. This scene includes a walk-on appearance by Barbara Pepper, who was famous for her role as Doris Ziffel in the 1960s sitcom Green Acres. She has one line, but it’s a good one. After telling her friend that her boyfriend wants to stay with his wife for Easter, she tells her she had asked him, “What do they expect you to do, lay an egg?” And just like that, she’s gone. As the news of Crystal’s affair with Buck Winston has been let out in the open downstairs and upstairs, Crystal is on her way up to see Sylvia. Three of the smallest women in the room grab Sylvia (it looks awkward, but it’s funny!) and push her into a closet, locking it. Crystal comes in, looking for her. Someone opens the door and Sylvia screams, spilling out of the closet, many pieces of clothing stuck to her. Sylvia blames it on Mary for getting the secret out of her, which is not hard to do. The film ends with Stephen arriving at the club (unseen, of course, because there are no men in the movie) and Mary running toward him, arms open for him to take. This ending irks me because she is running back to a man who cheated on her and she could at least demand an apology or something for all the pain he has caused her. But I suppose that’s just the way it was sometimes with marriage and infidelity in those days.